The Silicon Valley electric car startup Project Better Place showed off a prototype for its electric vehicle in Israel this weekend, and said partner Renault-Nissan (Renault is building the cars while Nissan, via an agreement with NEC Corp., is supplying the swappable batteries) would likely spend between $500 million and $1 billion into building them. We contacted Project Better Place and are waiting to hear more on the partners’ investment. Project Better Place’s car just looks like a regular sedan according to reports and images on the company’s website, but with an electrical socket and a screen showing the battery power, instead of a gas gauge. The cars are said to have a range of 100 km in city driving and up to 160 km on the highway before needing to be recharged or swapped. 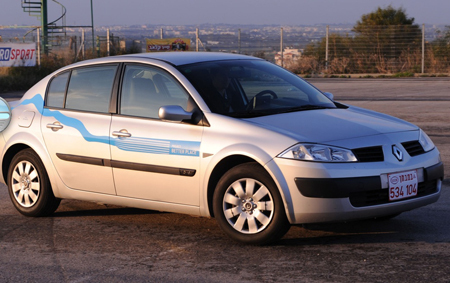 The aim is to have a pilot of several hundred cars in Israel next year. The first vehicles should be available to the public in late 2010. The startup is in the process building an infrastructure of electric vehicle charging and battery-swapping stations across Israel, where it will use largely solar energy generated in Negev Desert. In March, the company started to work with Denmark’s DONG Energy to introduce the electric cars there, where the batteries will help the country with intermittency due to its high use of wind power. Project Better Place has already raised at least $200 million dollars from Israel Corp., Ofer Shipping Holdings, Morgan Stanley, VantagePoint Venture Partners and private investors. That’s a lot of money (though only a drop in the bucket needed to get its countrywide networks built). While Project Better Place is focusing on the infrastructure, Renault-Nissan will be investing those funds into developing the vehicles.